Mr Pimplé has completed Specialist training from the London Deanery followed by an advanced fellowship in Upper limb surgery at the King’s College hospital. 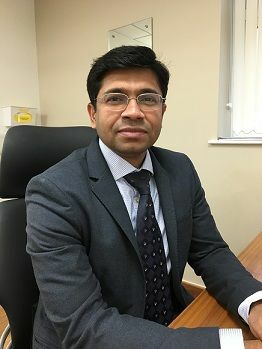 He has been a Consultant since 2011 specialising in surgery of the hand, wrist, shoulder and elbow. He uses advanced arthroscopic (key hole) and minimally invasive techniques often as Awake Daycase surgery. In addition, he performs joint replacement surgery using latest implants. His trauma practice includes fixation of fractures and ligament injuries in the Upper limb. He is one of the few surgeons in London offering key hole surgery for arthritis in the thumb and small joints of the hand. He offers a comprehensive multidisciplinary upper limb service through close links with hand therapists and Physiotherapists. Injections including PRP (Platelet-rich plasma) are offered for selected conditions. Shoulder and Elbow surgery: Impingement, tendinitis, rotator cuff disease, instability, arthritis. Hand and Wrist surgery: Carpal tunnel syndrome, Dupuytren’s disease, scaphoid fracture, ligament injuries, arthritis. Mr Pimplé has presented in international meetings and published in peer reviewed medical journals. He is on the faculty for local and international teaching courses.